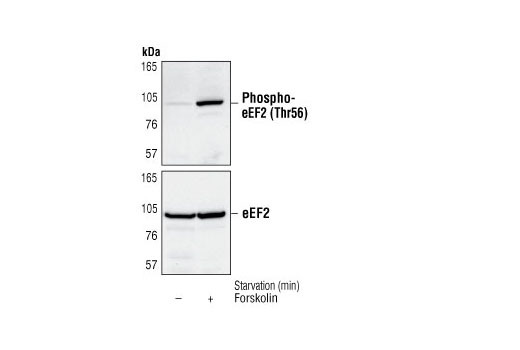 Western blot analysis of extracts from C6 cells, untreated or forskolin-treated (10 µM for 60 minutes), using Phospho-eEF2 (Thr56) Antibody (upper) or eEF2 Antibody #2332 (lower). 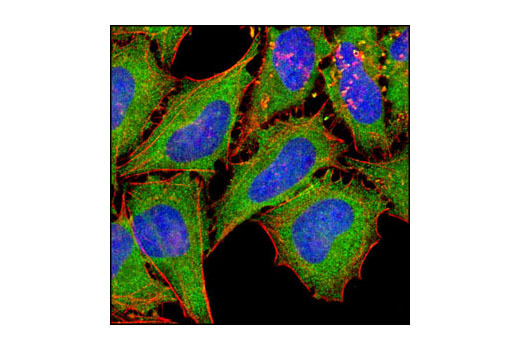 Confocal immunofluorescent analysis of HeLa cells using eEF2 Antibody (green). Actin filaments have been labeled with DY-554 phalloidin (red). Blue pseudocolor = DRAQ5® #4084 (fluorescent DNA dye). eEF2 Antibody detects endogenous levels of total eEF2 independent of phosphorylation. Polyclonal antibodies are produced by immunizing animals with a synthetic peptide corresponding to residues at the amino-terminus of human eEF2. Antibodies are purified by protein A and peptide affinity chromatography. Eukaryotic elongation factor 2 (eEF2) catalyzes the translocation of peptidyl-tRNA from the A site to the P site on the ribosome. It has been shown that phosphorylation of eEF2 at threonine 56 by eEF2 kinase inhibits its activity (1-4). eEF2 kinase is normally dependent on Ca2+ ions and calmodulin (5,6). eEF2 kinase can also be activated by PKA in response to elevated cAMP levels (7-9), which are generally increased in stress- or starvation-related conditions. A variety of treatments known to raise intracellular Ca2+ or cAMP levels have been shown to result in increased phosphorylation of eEF2, and thus to inhibit peptide-chain elongation. The inactive phosphorylated eEF2 can be converted to its active nonphosphorylated form by a protein phosphatase, most likely a form of protein phosphatase-2A (PP-2A). Insulin, which activates protein synthesis in a wide range of cell types, induces rapid dephosphorylation of eEF2 through mTOR signaling and may involve modulation of the activity of the PP-2A or the eEF2 kinase or both (10). Nairn, A.C. and Palfrey, H.C. (1987) J. Biol. Chem. 262, 17299-17303. Ryazanov, A.G. et al. (1988) Nature 334, 170-173. Carlberg, U. et al. (1990) Eur. J. Biochem. 191, 639-645. Redpath, N.T. et al. (1993) Eur. J. Biochem. 213, 689-699. Nairn, A.C. et al. (1985) Proc. Natl. Acad. Sci. USA 82, 7839-7943. Palfrey, H.C. et al. (1987) J. Biol. Chem. 262, 9785-9792. Redpath, N.T. et al. (1993) Biochem. J. 293, 31-34. Diggle, T.A. et al. (1998) Biochem. J. 336, 525-529. Hovland, R. et al. (1999) FEBS Lett. 444, 97-101. Proud, C. (2000) Translational Control of Gene Expression. Cold Spring Harbor Laboratory Press, NY, 719-739.